When Star Wars: the Old Republic launched last year, peripheral maker Razer was ready, delivering a stylish mouse and headset combo that evoked the feel of the Lucasverse at a modest premium over similar devices. Razer was not, however, ready with the $250 keyboard. Is the Force Strong in Razer&apos;s Star Wars: The Old Republic Gaming Gear? Delayed due to last-minute redesign (it used to feature a strip of indicators under the HOME keys) and fine-tuning the Switchblade technology that makes it so damn expensive, it wasn't until the spring of this year that the Star Wars: The Old Republic Gaming Keyboard made it into consumers hands. It is stunning. It is well-crafted. It's strong with the Force. It's also got a largely unnecessary and rather costly bit hanging off the right side. From a purely typing things while doing things on my computer perspective, this is a highly capable input device. Despite my largely positive experience with Razer as a whole, I was not expecting that. It's the keys, you see. I'm a fan of chunky keys with a definite mechanical click. This is a keyboard with flat, silent squares for keys, much like the Razer Blade laptop, with which it shares several features. It's the type of keyboard I will suffer on a laptop, but normally steer clear of in a desktop situation. That's been my loss, it seems. The keys on the Star Wars: The Old Republic keyboard are ultra-responsive, and the smaller form factor means my fingers are doing less lifting and more travelling, which really makes a difference when you spend all day writing. With my normal keyboard I often stumble over multiple presses; it hasn't happen with this unit yet. Once I ship this one back I'll be shopping for something similar (albeit a bit more practical). The unit certainly doesn't skimp on style, either. The same silver-grey plastic that adorns its mouse and headset counterparts is present here, etched with geometric lines evocative of the Star Wars style. They keys are backlit with a pleasant yellow glow, which an illuminated strip at the top and bottom of the keyboard can be adjusted to any solid color, set to cycle through the spectrum, or even tied together with Star Wars: The Old Republic, acting as ambient lighting in sync with the game. This is all easily controlled through the Razer Synapse software, the control panel for all your Razer peripherals. The Switchblade user interface, an excellent idea that began life as what might have been the ultimate portable MMO-playing machine, eventually devolving into a row of ten programmable keys and a touch-screen track pad. Let's boil it down to the very basics. The Switchblade interface is a series of programmable macro keys, each featuring a tiny LCD screen, and a touchpad that acts as a tiny display monitor. In a way it fulfills the promise of the Optimus Maximus keyboard that had so many PC gamers drooling back in 2007. In a game setting, players can create and assign their own icons to the buttons, creating custom macros on the fly for any game they deem worthy of their attention. It's the same sort of thing you can do with many other gaming keyboards, only now you're paying a lot extra for fancy buttons. And that track pad. While it works fine for the Razer Blade, I don't know a single person that would forego their gaming mouse to use a touchpad. The idea of having a default button dedicated to bringing up a virtual number bad in the stop a real number pad would be on a normal keyboard pretty much defines the absurdity of the device in this context. Is it useful as an additional screen for displaying maps or boss tactics? Sure it is. So's your phone. 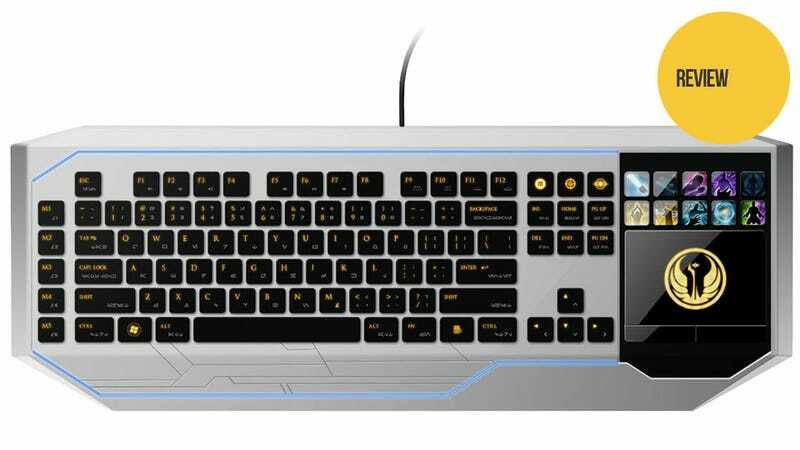 I would love to see a version of the Star Wars: The Old Republic gaming keyboard that utilized the same style and mechanical parts, but did away with the expensive gimmicks. That, in my mind, would be the perfect companion to Razer's other Star Wars peripherals and a fine way to enjoy the game you soon won't have to pay for. As it stands I just can't see recommending the product in its current configuration. Save your credits for other bits of bantha pudu.